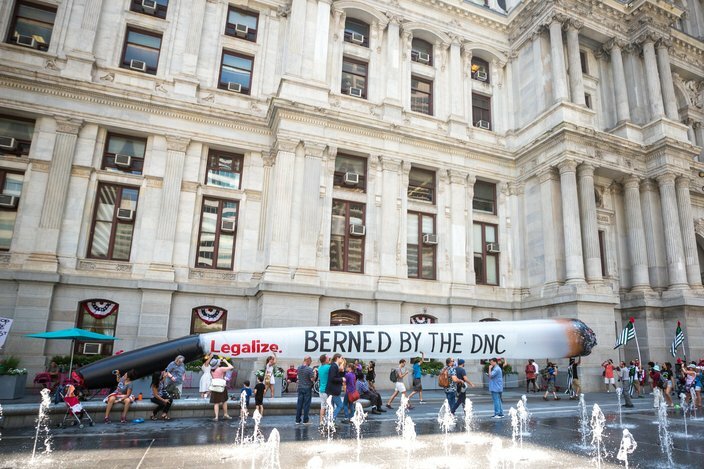 Marijuana legalization groups along with hundreds of Sen. Bernie Sanders supporters marched on South Broad Street from Philadelphia City Hall to the Wells Fargo Center, the site of the 2016 Democratic National Convention, on Monday, July 25, 2016. 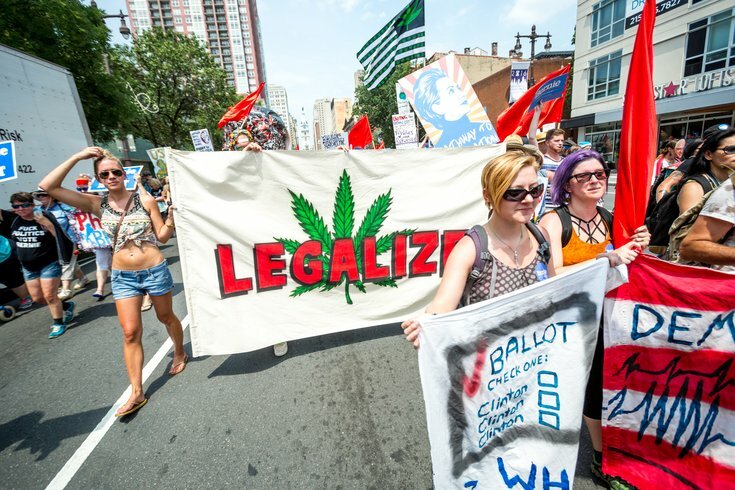 Originally planned to begin before noon, the march's start time repeatedly was moved back as the demonstrators continued to gather at City Hall, all braving the oppressive city heat, clocking in at more than 95 degrees at 1:30 p.m.
"We want to make sure all candidates are for full-legalization of cannabis," said Nikolas Schiller, co-founder of DCMJ.org, an activist group that helped get cannabis decriminalized in Washington, D.C.
A 51-foot joint is carried around City Hall shortly before beginning the march down Broad Street to the Wells Fargo Center, the site of the 2016 Democratic National Convention. For Monday's protest march, PhillyNORML had the words "Legalize. Berned by the DNC" written on their 51-foot long prop – the length representative of Washington, D.C.,. as the 51st state. The second 51-foot joint belonged to another marijuana legalization group from New York and read "Legalize Cannabis Now," joined the march. "We've got a lot of East Coast unity," Schiller said. "We want cannabis de-scheduled," he said. Presently the U.S. Drug Enforcement Administration classifies cannabis as a "Schedule 1" substance with no currently accepted medical use and a high potential for abuse. But, Poe said that description needs to be changed, as 25 states – including Pennsylvania – have "directly contradicted federal law" and permitted the use of medical marijuana. "We need to de-schedule cannabis so that the medical benefits of cannabis can be studied by people in lab coats, instead of by people in dreadlocks," he said. "Cannabis reform is bringing the police and the people together," Poe said. "They realize that we just want to be a normal part of society." Sen. Bernie Sanders supporter, Patrick Devine of Seattle, Washington, left, is shown draped in the American flag. 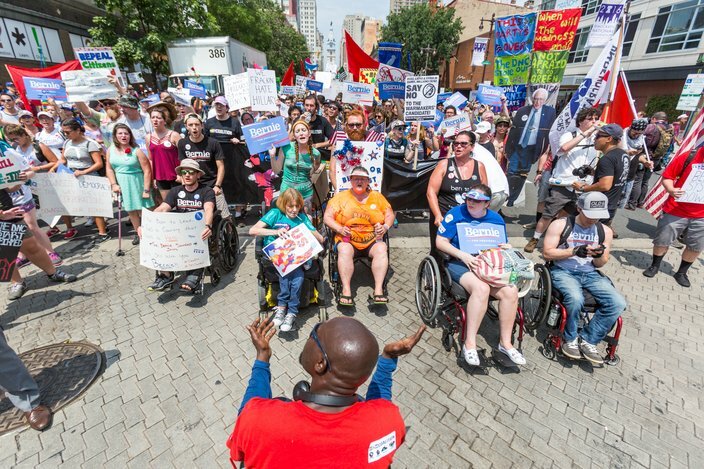 To the right, hundreds of demonstrators are seen marching from Philadelphia City Hall to the Wells Fargo Center on Monday, July 25, 2016. "I don't think there's tension here. I think there's just a lot of energy," he said. "For us, this is about making sure these protesters are safe," Nestel said. "We want to make sure everyone has the right to freedom of expression, but we don't want that to turn into violence." 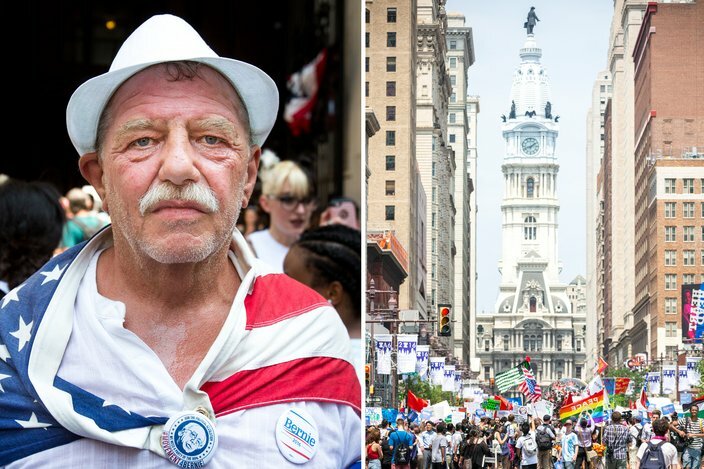 Chris Goldstein of PhillyNORML said that he felt his organization and the Sanders' supporters could help each other. Sanders supported decriminalization of cannabis – even presented a bill in the senate that would allow states the ability to decide if the drug would be legalized in their own state. "We believe that they should adopt Bernie Sanders platform," said Goldstein of all political candidates. "We hope people see that this isn't a protest. Instead, we are cheering (politicians who support legalization of marijuana) on," he said. "(Legalization) is getting closer and closer. We have a real chance of it." Anya Harjung, of Delaware, who attended the rally as a Sanders supporter said she wanted to show her support for the Vermont senator, and Independent presidential candidate Jill Stein, following the recent release of leaked Democratic National Committee emails that appear to show the party kneecapped the Sanders' campaign. "I hope we can swing some of these delegates away from Hillary and toward Bernie or Jill Stein," she said. "They support some ideas that are so radical, that (Democratic party's leaders aren't ready for it." "If it's decriminalized, why are there still people in jail," Ievoli said. She said she supports returning non-violent offenders of crimes related to cannabis to society, pointing out that the drug has "less toxins than cucumbers." "This isn't about a drug anymore," Ievoli said. "This is something that's less toxic than your food."